I finally finished planting what needs to be planted right now after work on Monday. Rob and I worked out there until it was getting dark, with me planting and him getting the sprinklers set up. We had several other previous sessions where we planted parts of the garden. It was so good to be finished for a while anyway. Patsy and I had been hand watering our newly planted rows and starts up until Monday night. What a relief to have the sprinklers going! On the lower right hand side, you can see tiny corn plants. I started them in the greenhouse and set them out. I’m trying corn for the first time in this garden and am trying an experiment. Since the area is small, I’ve made small blocks for pollination purposes. There are 4 extremely short rows, with about 5 or 6 plants in each row. I bought a corn succession package from Territorial with Sugar Buns, Bodacious and Golden Jubilee. The idea is that you plant them all on the same day and harvest at different times. So, these plants are the earliest, Sugar Buns, and there is a small block of each kind in the garden, sown from seeds. We shall see. All I want is corn for fresh eating for here and for family Sunday dinners. My sister often has extra that I freeze. Last year, her extras came already in little cartons, because she processed it for me! (Thank you sis!) That was the easiest corn I ever put into the freezer:). We don’t eat a large quantity of frozen corn, but love having some on hand for those times when Rob wants it, which he has several times lately. You can see the little pepper plants that we started in the greenhouse. 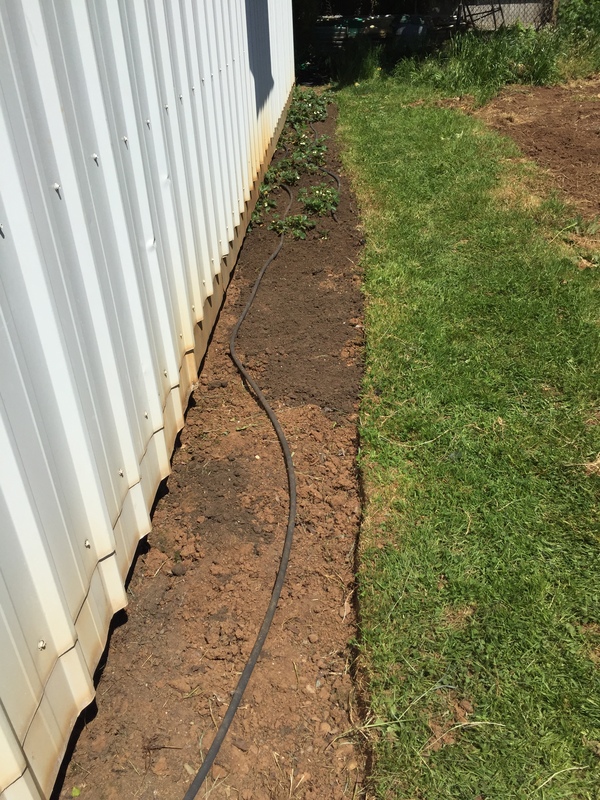 There is another set of them planted on the far end by the sprinkler. There are Anaheim 64, Jedi Jalepeno, Serranos (hot for salsa–I need about 5 peppers total for my salsa–whoops), Lunchbox (small red, orange and yellow sweet peppers), Carmen (sweet Italian–long, mild, and will turn red), and Pepperoncini (which are actually long and squiggly and have a tiny little bite). My peppers did not work well last year. 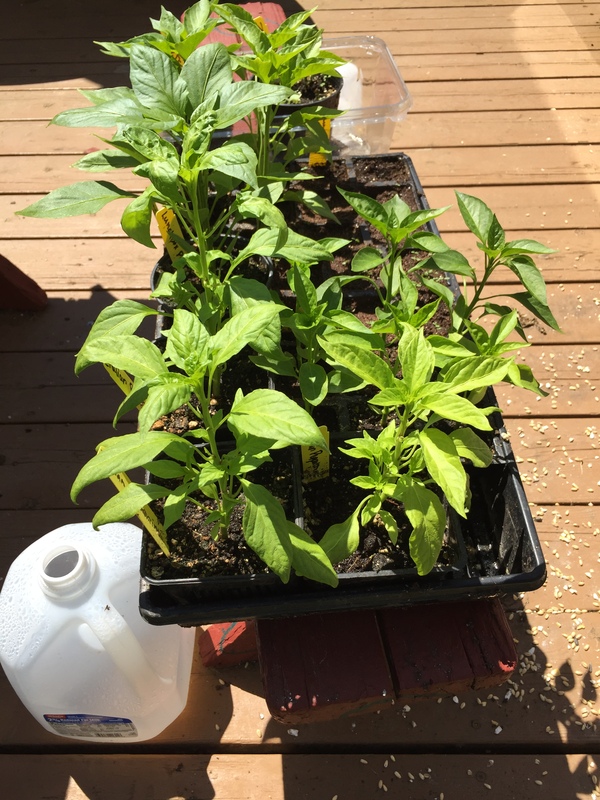 I’m hoping by moving them around, growing my desired varieties, and fertilizing them, they will do better this year. I still have a very few frozen ones from 3 summers ago–time to get those used up and new ones frozen! The tomatoes look great with that red mulch. In front of them are Oregon Sugar Pod II snow peas. 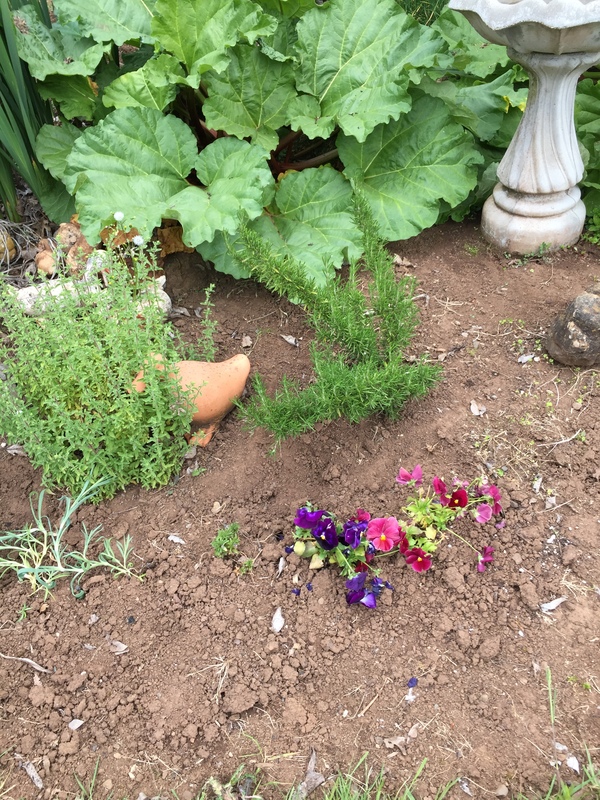 I’ve already planted another small planting, as we ate them all summer long last year, in many little plantings. I’m sure you can see that the lettuce and spinach are growing, and there is more lettuce planted elsewhere already for when we eat this. I’m letting those green onions go to seed. I’m having quite a bit of success letting the green onions grow themselves. I finally finished the strawberry bed. I cleaned out the berries I planted last year, tore out the really old ones, and planted bush Delicata squash and zinnias in the blank part. The soaker hose is not up and running as well. I have nice oregano, rosemary, thyme, sage, and of course, baby parsley growing in front of my rhubarb. They were planted last year, and came back strong. I put a few of the clove pinks in front of them. They were planted from seeds my sister brought back from England. Also, there is a tiny winter pansy my aunt gave me last year, and I added some other pansies. On the other side (not pictured), there are chives, mint, and a lot of weeds still. 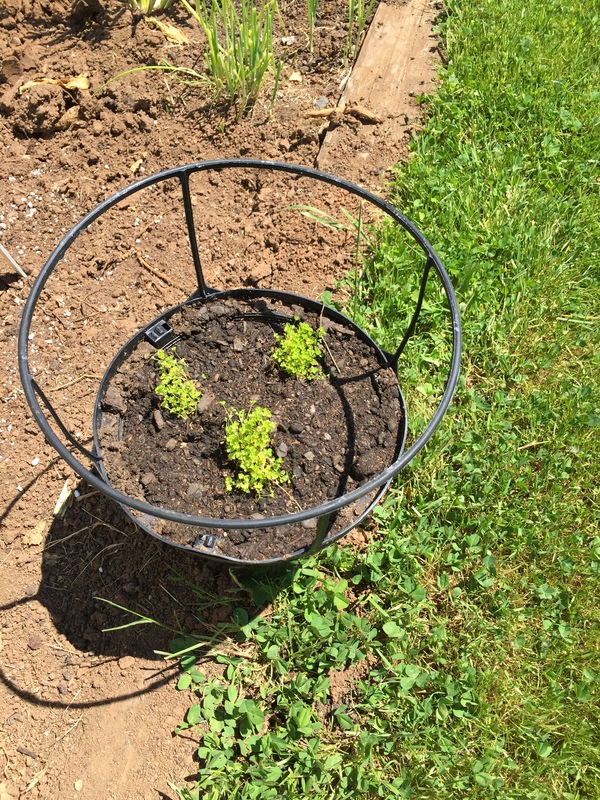 I did plant some more basil, cilantro, and dill in the garden in rows, and hope to have many, many herbs this summer. Now I’m waiting for seeds to come up. I’ve planted green and yellow zucchini, pickling cucumbers along with slicing and lemon cucumbers. There are Winter Luxury Pumpkin and Sweet Meat Squash seeds in their hills, along with many other seeds waiting to sprout. 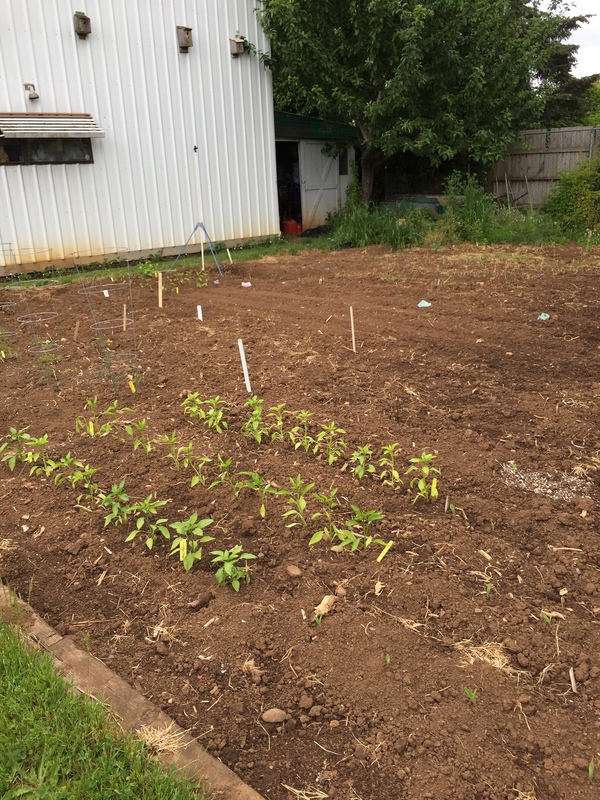 The onions, tomatoes, and peppers are from starts. There are some potatoes coming up, some that I planted, and some volunteers from last summer. The compost heap has potatoes and cilantro growing like crazy on the edge of it. It was no easy task to get everything fitted in that I wanted. At our old house, Rob always used to just go till up another area for me to plant when I ran out of room. We don’t have that option here.It helped to not have to make space for too many beans this year. I kind of overdid the beans last year, but will succession plant enough to eat them all summer. I may not have to can any this year. I will count the leftover jars when the plants are bigger, because we will keep eating the canned ones until then. 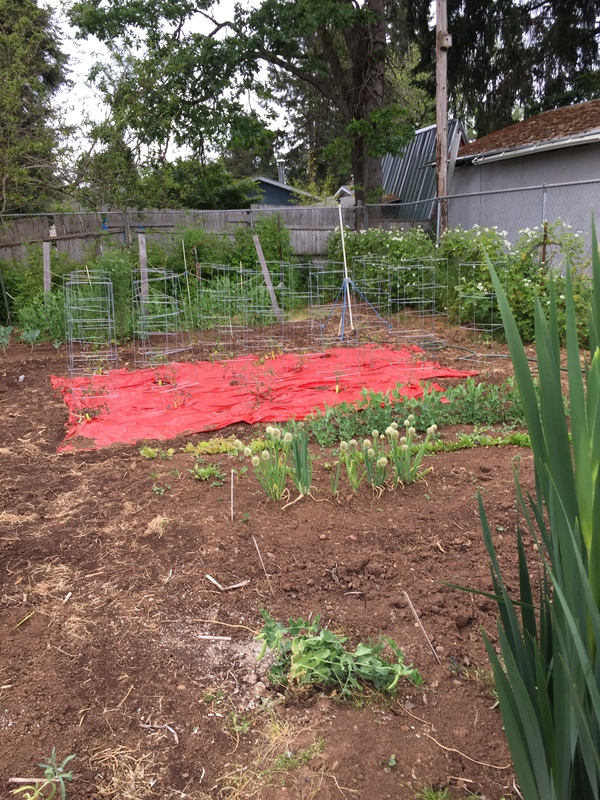 There is still a small blank space for watermelon, cantaloupe and future small plantings of lettuce, snow peas, and bush beans. The melons are in the greenhouse, getting a little more size before I plant them out. I am going to try the green mulch with them. I’m not going to on the zucchini. Sometimes, you just don’t need or want a bumper crop of that! I will re-plant any areas that open up as the summer progresses. I always grow a new batch of zucchini and cucumber plants for fall, along with some other things like greens, boc choi, beets, and snow peas, perhaps. It’s kind of what I’m in the mood for, have seeds leftover for, and can find space for in July and August. The blue berries are blooming and forming small berries. So are the raspberries and Marion berries. The artichokes have been giving me a few artichokes, which I love. The peach tree has little fuzzy peaches on it. There is a head of leaf lettuce that I will cut this week from a volunteer plant, which I had tiller man go around. It’s a time of promise. The seeds and plants are in and the weeds have not started to grow around them yet. So, I’m planning to bask in that feeling for at least a week and just keep turning on that automatic sprinkler system:). I will turn my attention to flowerbeds next. You will have lots of yummy goodness soon! I rarely plant anything from seeds, but sprinkled a package of zinnia seeds into an old canning pot on Monday. I am thrilled to report I have lots of baby zinnias popping through the soil this morning. Isn’t planting so exciting? your garden looks huge. I could only dream of a garden so big. I hope you get bushels of food. I do get a lot of food from my garden. Sometimes, I get too much:). But, sometimes crops fail as well, so I always overplant a bit. I can and freeze the extra, take it places and feed it to people and/or give it away. It’s what I call a useful hobby because I enjoy the process as well. Your garden is looking great! I’m glad to hear that you are waiting for your squash seeds to come up. I was hoping that I was not too late in getting mine planted (they are going in on Saturday if I have time). I just wish everyone could come get some:). Now that we have the sprinkler system up and running, those little babies are looking perky and healthy, and growing better! I’m just letting them grow and hoeing out any I don’t want. Maybe I’ll dry some when the plants get bigger. I’ve done that before. The red mulch is hilarious. I’ve never seen it before. I don’t know how your back … and knees … take all this gardening. I’m glad for you that you are able to physically do all this hard work. I wonder if I can grow a watermelon on my patio? I think I might just try. You are making me want to watch things grow. I have been taking Pilates since September. I am the worst one in the class. Still. The worst. After 9 months. I do figure that’s because everyone that is not in shape quits after 1 session–several have come and gone or they never come at all in the first place. Except me and the amazing regulars. We just keep on. The teacher is great and makes things easier for me than she does for the lady who is at least 15 years older than me, and did is all with one arm when her other one was broken. Planks and everything. Really. No joke. It’s pretty humbling:) It is really helping me with all this bending over and so on. At the beginning, I could not get up from off the floor without pushing off on something. Now I can. I could not sit criss-cross applesauce because my hip joints were so stiff. Now I can. My back is stronger, and while I can’t do all the stomach exercises, I can do more than when I started. My arms are stronger, and I’m finding it easier to dig. I need some parsley plants! I bought a 6 pack of cherry tomato plants because they were way cheaper that way and there were actually 10 plants so I am in cherry tomato trouble I am sure. There are some new people in the neighborhood and sharing them could be a good way to meet them! Your garden is going to be so beautiful when everything comes up and starts producing! So far, this year, I haven’t planted any vegetables, yet! My flower seeds haven’t come up, either, so I think I might have to buy a few plants and put them in, and hope for the best!